This post will be coming around either tomorrow or the day after. I'm going to go into detail about each of these ships. 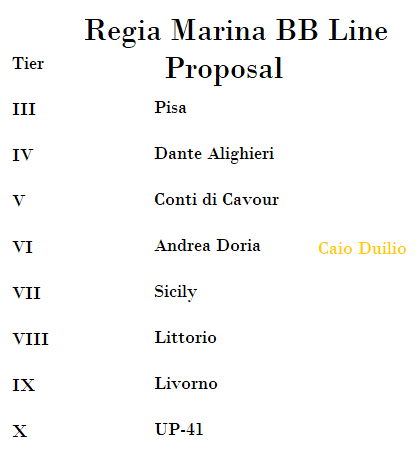 NOTE: Caio Duilio is a suggested Tier VI BB premium which I will talk about eventually. FYI: This thing would have 18 inch guns. Or else it would be crap at tier X. Let me know if you like the names "Sicily" and "Sardegna" respectively or suggest new ones! And of course, tell me your suggestions. I'll be shortly following this up with a post going through each of these in quite some detail. 1\ Could you add the design name of the TVII ? Since you used a placeholder name, I don't know what design you're referring to. 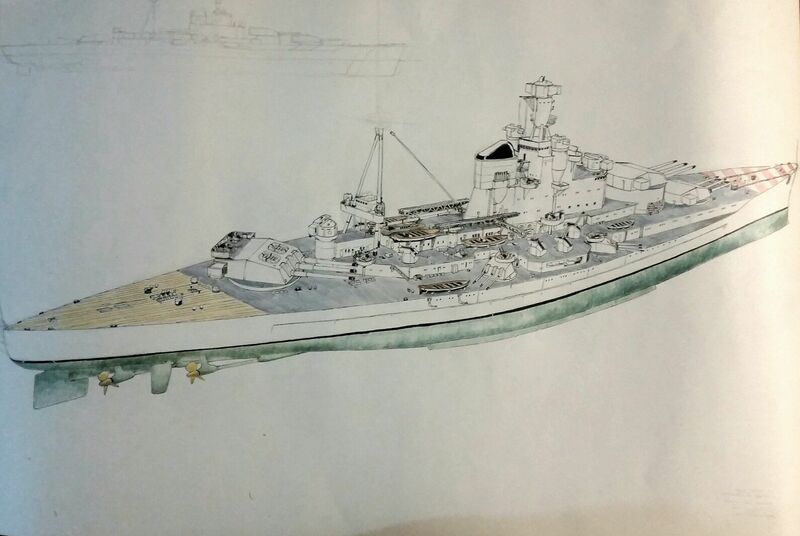 2\ Livorno (the 1928 23kt CC) has not a chance of making it at tier IX. And not even at TVIII. Not sure what you're thinking putting it above Littorio. I mean, it's slower, has less armor, only has six guns, is much less heavy and thus has less hitpoints, has less AA power - I even wonder if it'd belong at TVII or not. It's even arguably not belonging any higher than TVI. 3\ UP41 wouldn't fit at TX indeed. But it fits TIX perfectly well. Also you can't randomely slap 457mm on it cause you want. That's not how it works. If you wanna make a 457mm-wielding TX, work around Cassone's project, but don't just alter the caliber of a planned design without a basis. 4\ Not sure what Pisa you're referring to but if it's the one I know, it's an armored cruiser. Not even a battleship. Doesn't belong in such a line at all. 5\ Why use Cavour and Doria's rebuilt version both at TV and TVI ? You could use the original of one at TV and the rebuilt of the other at TVI. Thank you for the criticism. I will take this into account. Good Work Pagster 123. Keep Going. Thank You. GOOD! Can you do something like that also for DD and CL/CA?